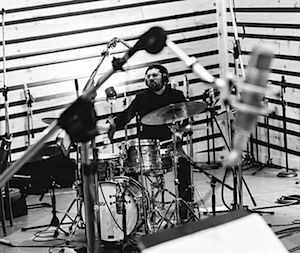 If we look at drummers out there today, we see lots of fast guys, tons of ‘choppy’ guys and some tasty groovers, but when was really the last time you saw a new exciting drummer? 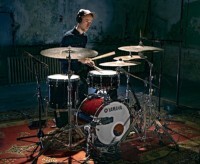 A drummer want to listen to as closely as you can, to not miss any idea, any little detail or minute nuance. 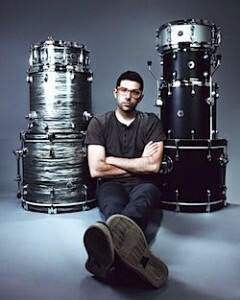 I give you Mark Guiliana. 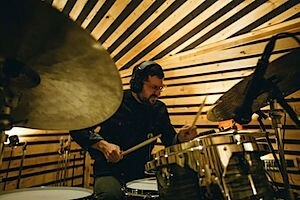 Mark’s precise and tasty jazz fundamentals paired with a creative approach to modern electronic beats make him a unique and in demand drummer across many genres. His many protects push all kinds of boundaries and redefine modern jazz for a new generation. Still in his early thirties Guiliana has secured a drum stool on the stages of tomorrow and might just lead a whole generation of drummers into a new, exciting territory. You started quite late at the age of 15. What got you into drumming? It was just kind of another thing to do. My parents always wanted me to be active so it was just a very innocent, no-expectations thing to get involved in. It wasn’t until after the lessons had started and I got into it I realised that it was something that I wanted to pursue. I studied privately with Joe Bergamini, he was my first teacher. From there I started studying with John Riley, another amazing teacher. Later I went to William Paterson University where I did my degree in jazz and performance. So jazz has always been your preferred style? Not really. At the beginning I was into Red Hot Chili Peppers, Nirvana, Soundgarden – all the stuff on MTV. I was born in the 80s, when I was 15 it was ’95, so all the music of the 90s. It was Joe who really laid a nice foundation that included all styles and when I discovered jazz is really pushed me down that road. Did the curiosity in electro come from Joe too? No. When I was at college a friend of mine gave me a Squarepusher album and it reminded me of the way I felt the first time I heard Tony Williams. When I first Tony maybe I didn’t quite understand it, but I felt something in my body that I’d never felt before. It was similar with Squarepusher, Aphex Twin and those guys. I didn’t really understand it but it really hit me on a deeper level and I just really wanted to go down that path. How did you first approach electronic music on the drum kit then? Jojo Mayer was an inspiration, Zach Danziger also. I would go to see them play a lot and I’m very grateful to have them as friends now. They were the guys who made me understand that it’s possible but as the case with any style, the most important thing is to really go to the source. A lot of the stuff is seemingly impossible to reproduce, it’s just too much for one person to do, but in the attempt of doing so you can end up in some pretty cool places. Even my failed attempts in playing Squarepusher beats resulted in some interesting things. Tell me about your time with Avishai Cohen. You once mentioned that was the time that got you comfortable playing odd time signatures? I met Avishai when I was still in college. I was a big fan and went to a lot of his shows. I was just amazing music and never sounded like numbers to me – the last thing I wanted to do was inject that into the music. He wrote everything on piano, just sat down and played it to me and it always felt really natural and nice. I just played the song and tried to not let the theory get in the way. Do you still use counting or do you just try to learn the melody and know it inside out? That’s always my goal but sometimes there’s a shorter window. You maybe have a rehearsal just the day before the gig and need to get inside of it that way. Since Avishai was more a band and consistent project it was nice that we had the time to truly internalise the stuff. Did Mehliana come about in a similar way? Yes, I’m just a big fan of Brad Mehldau, he’s one of my favourite musicians. I met him a few times throughout the years at different festivals and after he came to see my band (an early version of beat music – so a little more electronic) he said we should play in kind of that sonic world. His main output is his trio or playing solo which is always an acoustic outfit, so that was a departure from that. The first time we played was in 2008. We got together at my rehearsal space and just improvised. In a way even that first encounter doesn’t sound that different from what we do now. I’m so grateful for that situation. It’s so intimate and there is so much room. It’s very cool to explore in that world with somebody of his caliber. You just mentioned beat music yourself. You recorded a whole album (‘The Los Angeles Improvisations’) completely improvised? How do you even approach something like that? We are all very likeminded guys and we just played and played. It was important for me to explore all the different combinations of the four of us. For example all four, different trios, all the different duos, everybody did a solo track and so on. Mainly because when you’re all playing together it’s easy to fall into the trap of everybody playing the whole time. That was pretty much the only thing I thought about in advance. Afterwards I just took everything and selected start and end times. So what you hear on the album is what happened it’s just that I decided what chance to use. We have so many shared influences, similar tastes and ideas where the things could go that the idea of the musical result was to try to make it sound compositional. How come the love for improvisation? I mean some people just prefer to learn songs and be done with it. 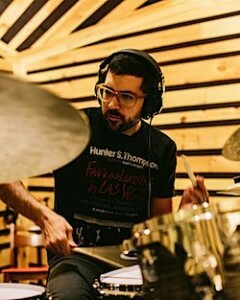 You recorded the drums for David Bowie’s last album Blackstar. That must have been an experience. Yes, it was amazing! Before Blackstar I had already played on one Bowie song which was a collaboration with Maria Schneider who is a great composer in New York. David was a big fan of her and her big band. I got recommended to do that song and that led to recording Blackstar. I can’t say enough great things about him. He was an incredible guy, I learned so much and I’m so grateful for the opportunity. You mentioned earlier that Bowie had programmed drums for all the songs’ demos. Did you still get some space to put your own note on it? Oh I was happy to play his ideas but it was all still a sketch. Of course I wanted to honour those parts but he was always pushing and encouraging us to look for our versions of things. I heard some of the All Star Trio with John Scofield and Brad Mehldau. Great stuff. Can we expect more of that? We certainly talked about doing more and recording but there is nothing in the books for now. I think initially it was just John and Brad wanting to do something together for a while and when they found the time they decided to go down the more electric route. The fact that Mehliana already had a blueprint it just made send to go in that direction. 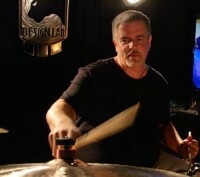 You recently released a book/DVD ‘Exploring Your Creativity On The Drum Set’? I had an idea for a book and it was gonna be 20 or 30 pages of really detailed text, really trying to articulate some concepts and ideas; and then it would be followed by 60 pages of blank manuscript paper. It’s like: here is the idea, now do it! It’s just not a great business model! I do feel very strongly about the idea though. It would be impossible for two of those books to look the same and that’s the whole point. I tried to incorporate that a little bit in this book where there are times where I start an exercise but then there is some blank space to hopefully encouraging someone to continue it themselves. The examples that I provide are of no more or less value than the ones the user will provide – and that’s so important. It’s tough sometimes books: you see this page of examples, you play them and then you check them off and think you’re done. I did that too and I needed that but I want to convey that idea that it’s never done. I think we have to take hold of our creativity and be more proactive. When all the information is coming from the outside it’s a more passive way of learning. It’s also important but it’s more passive, you’re never responsible for generating the ideas. You’re improving, you’re working on things but you’re not building the things inside. For me, especially when it comes to improvising, you have to build your own stuff, so I just try to offer some ways to do that. You’ve also mentioned that you never practise patterns because it’s dangerous to fall into them. I have certainly practised patterns in the past but I’m really afraid of getting too attached to certain things in my practising because they’re bound to just appear in my music the way I practised them. Do you have any tips on how to find ‘your thing’? It’s very difficult and it doesn’t mean that your true self has to be incredibly unique or different, it just has to be you. I found restrictions really help, thinking about what not to do, and just being really, really self-aware and mindful of what I’m doing. Is this me? I don’t wanna have stuff just come out. It’s a long process. I went through a heavy emulation phase where I was really just trying to play the stuff I saw my heroes play but then I started to realise that that’s just not me and I have no room in my output for my own stuff. Sometimes if you put yourself in uncomfortable situations you can’t rely on stuff you normally do, so that’s when your true self might come out. I’m still trying to figure it out myself. There is lots of peer pressure, now you go onto YouTube and you hear all this amazing stuff and you think I need some of that… You just need self-confidence and knowing that no one can be a better version of you than you. It’s very cliché but so true. I really believe in that. I think people can relate to that too. People know when something is real. They just know. It doesn’t matter if you’re playing a bunch of virtuosic stuff or very simple there is an intentional feeling. When Steve Gadd plays “Bom, Gak, Bom, Gak” there is something about that, it’s the truth. That’s just him. He’s always expressing his true self. I think in any art – and in life – everyone is trying to figure out who it is they are. We’re lucky to have an outlet to explore that. I feel like I’ve learned more about myself through music than I have through anything else. You’re using the D.R.O.P. system in your book where you address the different building blocks Dynamics, Rate, Orchestration and Phrasing. How did that approach come about? That was a reaction to trying to avoid patterns. I can’t really say I don’t want to practise anything too specific so I’m just not gonna practise. I still want to be working on things so I just zoomed out a bit, started working on the tools and I found that almost everything we play could fit into those four categories. There are certainly other categories too but those four seemed like the big picture. There are things to work on inside each block but really it’s the combination of those. It’s nice to be thinking about that kind of stuff rather than smaller details when I’m playing. So you’re going back to working on the very basics? Yeah, the stronger the foundation the more confidence I have to make statements or to build on it. You can always improve. Even just playing triplets slowly with a metronome your sound can improve, they can be more relaxed, more precise – there is always room for improvement. Has teaching always been a passion of yours then? Sharing has certainly been a passion. I’ve always done some teaching but I’ve had great teachers and from those experiences… look, I wouldn’t even be playing music without great teachers. Both my parents were teachers. They had nothing to do with music but still that lifestyle effected me. I love sharing. For me the message nowadays is more about trying to encourage people to express themselves because to me that’s what would make the music world a better place, honest expression. Of course you learn so much from doing it too, having the interaction with people and hearing what they’re thinking. I really get a lot from that experience. Do you think there is a problem of people sounding the same because they’re chasing after the same trends? It’s ok actually. It’s the same with everybody dressing the same or thinking the same. When I think of my favourite musicians they are the guys who had the courage and the confidence to make their own decisions. Quite often those guys are misunderstood in the moment too. For me it’s just the ultimate goal in everything I do. I’m certainly far from it. That’s why it’s such a simple but life-long goal – being comfortable in your own skin. Now that I have a small son you start thinking about the same things. How do you instil confidence in him? It’s the same goal whatever the path is: be you, do it with confidence and do it the best you can. I’ve been around Europe a lot 2016 with my Jazz Quartet and we just recorded a new album which will come out some time this year. Yeah generally Beat Music and the Jazz Quartet are running on parallel paths but I think 2017 will be a bit more heavy on Jazz with the release and touring. I’m just trying to keep my head down and go. You’re touring a lot then. How is being away that much with the little one at home? It’s tricky but for now it’s ok. He’s two so I can get away with it. We’ll see how it is when he grows up. The stuff I’m doing feels right. I just got to listen to my gut more and always do what feels right. Thanks a lot for your time Mark!